Hi there friends! Hope your week is off to a good start. Just a quick note to let you know I am a guest over at Karen's blog Mummy Do It today. 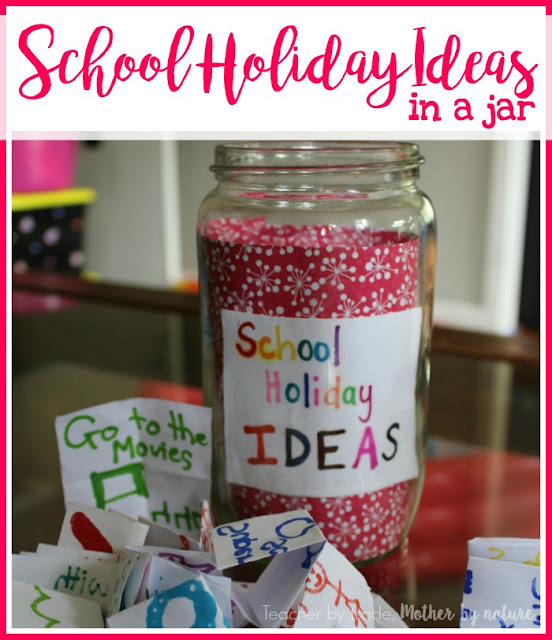 I am sharing an updated, 2016 Edition of 'School Holiday Ideas in a Jar'. There are more ideas & more activities, to keep your children entertained these school holidays. Enjoy! Head over to Mummy Do It and share the blog love today. Leave a Comment, Pin, Tweet, Share, whatever you like - I would really love to hear what you think about 'School Holiday Ideas in a Jar', and if you have any activities to add to the list, please let us know. While you are over there, be sure to check out more of Karen's amazing blog. She shares recipes galore, organisation tips, fun things for kids, the list goes on. Thank you for having me on your blog, Karen. If you are visiting from Karen's blog - Welcome! Thank you for visiting Teacher by trade, Mother by nature. Read more about me HERE. If you like what you see and read, please Subscribe to my Blog.